Arianespace is the hub of space-based activity, this already their third liftoff in the new year with the successful launch of Sentinel-2B. Together the Sentinel-2B and Sentinel-2A make a complete set of eyes to provide Europe with vital Earth observation data. 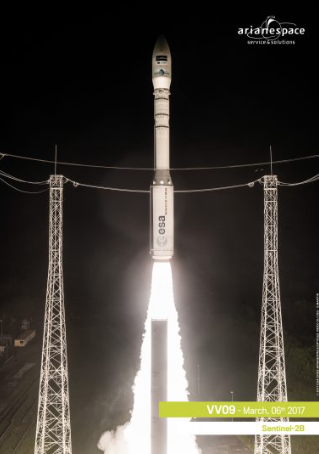 Continuing Vega’s track record of success, Arianespace’s ninth flight with the lightweight launcher delivered Europe’s Sentinel-2B Earth observation satellite to orbit tonight during a mission performed from the Spaceport in French Guiana. This was the ninth consecutive on-target launch with Vega since its introduction at the Spaceport in February 2012, and marked Arianespace’s third liftoff so far in 2017—during which the company is targeting up to 12 missions with its launcher family composed of Vega along with the medium-lift Soyuz and heavyweight Ariane 5. Tonight’s Sentinel-2B payload is a part of the satellite system being deployed in the European Commission’s Copernicus program to provide Europe with continuous, independent and reliable access to Earth observation data. Sentinel-2B is the fourth Copernicus program satellite orbited by Arianespace, following the successful launch of Sentinel-1A on a Soyuz in April 2014, the lofting of Sentinel-2A aboard a Vega in June 2015, and the deployment of Sentinel-1B by a Soyuz in April 2016. Sentinel-2B was deployed during a mission lasting just under 58 minutes, with Vega departing the Spaceport at the exact instance of liftoff at 10:49:24 p.m., local time in French Guiana. After the propulsion provided by Vega’s solid-propellant first, second and third stages, the bi-propellant AVUM upper stage performed two burns, enabling the satellite to be released for operation in Sun-synchronous orbit. The total payload lift performance for tonight’s mission was an estimated 1,208 kg., with the Sentinel-2B spacecraft weighing in at 1,130 kg. Sentinel-2B was built by an Airbus-led consortium of companies, with support by the French CNES space agency and the DLR German Aerospace Center. Equipped with a multispectral, wide-swath, high-resolution optical imaging instrument, the satellite’s mission is primarily focused on monitoring land masses and coastal zones around the world. Its data will be used for applications concerning the monitoring of vegetation, soil types and habitats. Arianespace’s orbiting of Sentinel-2B—designated Flight VV09 in the company’s launcher family numbering system—was performed on behalf of the European Commission within the scope of a contract with the European Space Agency (ESA). Arianespace will continue its launch services for the European Commission, with eight more of the Galileo satellite-based navigation system spacecraft to orbit—with four planned to be lofted before year-end on an Ariane 5 mission. The European Space Agency also continues as a key customer for Arianespace, with six other missions currently in the launch services order book. Arianespace will maintain its sustained mission pace for 2017, with a heavy-lift Ariane 5 launch up next—planned for March 21 with the SGDC dual-use relay satellite for Brazil and Korea’s KOREASAT-7 telecommunications platform. Both spacecraft were built by Thales Alenia Space.